Could Arab Peace Corps Counter Extremist Message? Jordanian volunteers from Tikiyet Um Ali charity, right, hand meals to a poor family in an impoverished neighborhood in the heart of downtown Amman Sept. 5, 2010. The year was 1960, and the world seemed to be on fire: The Cold War was raging, and coups, conflicts and revolutions were taking place across the globe. That October, during the final weeks of his U.S. presidential campaign, then-Senator John F. Kennedy proposed dispatching a volunteer army of youths to non-industrial nations to help foster development and boost cultural understanding. 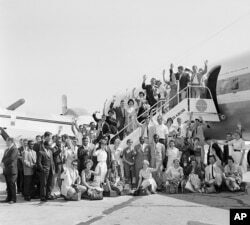 Ten months later, the first Peace Corps volunteers headed for Africa, and since then, more than 210,000 have served in 139 countries. “I think that they did more good for America than all the bombs we dropped around the world,” said Sami Jamil Jadallah, founder and executive director of the Washington, DC-based New Arab Foundation. Today, similar conflicts are playing out across the Arab world, and religious extremists, aided by social media, are manipulating and mobilizing vulnerable youth from across the globe. “Most of the fighters flocking to Syria and Iraq, whether from Chechnya or North Africa or Saudi Arabia, are youth who are politically marginalized, jobless, living in poverty with little self-worth and little hope for the future,” he said. The solution? An Arab Peace Corps that would recruit volunteers from across the Arab World — Muslims, Christians, North Africa’s indigenous Amazighs, Kurds and others — youth with college degrees in education, health care, engineering and agriculture, and send them to communities in the region most in need of their skills. Jadallah would also send volunteers to “at-risk” communities in Europe and North America to serve as role models and mentors for troubled youth who are “easy prey” to terror recruiters. During two years of service, volunteers would receive room and board and a small stipend. After completing their term, they would be given partial and/or full scholarships to graduate school. Maeena thinks the plan is very feasible. “How Arab governments would respond to the concept is tied to their own agendas," he said. "There are many differences between Arab countries today, as witnessed by the wars currently being stoked." Yossef Ben-Meir, a former associate Peace Corps director, is today president of the High Atlas Foundation, a nonprofit working to develop rural communities in Morocco. He outlines some of the challenges that Jadallah might encounter along the way. Gender could also be an issue, he said. But, he added, none of these obstacles is insurmountable, and they could ultimately benefit everyone. Ben-Meir says volunteerism is beginning to take hold in the Middle East, and he has first-hand evidence that it pays off — not just in terms of building communities, but in giving marginalized youth a sense of purpose. “Right now, I have partnerships with four universities in Morocco. At University Hassan II Casablanca, for example, there’s no movement of radicalism there. You don’t find unrest there because students are engaged,” he said. Jadallah is currently working to seek funding for the project. “Hundreds of billions of dollars have been wasted on war,” he said, adding that with any luck, governments and private donors will be just as willing to help fund peace.